The high military offices that CAIR's reach may extend to -- thanks to one individual. Wilfredo Ruiz has served in the U.S. Navy in two capacities, once as a lawyer under the Navy’s Judge Advocate General (JAG), from the years 1993 through 1997, and once as a chaplain under the Navy’s Chaplain Candidate Officer’s Program, which he took on after he had begun religious studies, in 2005, at a seminary in Hartford, Connecticut. Ruiz additionally is the Executive Director of AMANA’s sister organization, American Muslims for Emergency and Relief (AMER). AMER uses the same Miami physical and mailing addresses as AMANA. From 2005 till 2007, Ruiz attended the Hartford Seminary, where he worked on his Masters in Islam and Christian-Muslim Relations. The entire time Ruiz was there, the professor of Islam and Christian-Muslim Relations was a fellow Islamist convert named Ingrid Mattson. When Ruiz started at the seminary, Mattson was the Vice President of the largest Muslim Brotherhood-related group in the United States, the Islamic Society of North America (ISNA). In the following year, 2006, she became President of ISNA. Mattson founded the Islamic Chaplaincy program at Hartford Seminary. As mentioned, after beginning his education at the seminary, Ruiz worked to become a chaplain for the Navy, specifically a Muslim Chaplain. According to Ruiz’s bio, he worked as a chaplain at the Immigration Service Processing Centers in Puerto Rico and in Miami. Question: Did Wifredo Amr Ruiz go to seminary and take up chaplaincy specifically to better serve the radical Islamic goals of his bigoted group AMANA. Today, Ruiz acts as AMANA’s legal advisor. However, he also does legal work for another Islamist organization, CAIR. He is CAIR-Florida’s legal counsel. CAIR was established as being part of the American Palestine Committee, an umbrella organization acting as a terrorist enterprise run by then-global Hamas leader Mousa Abu Marzook, who was based in the U.S. at the time and who now operates out of Egypt as a spokesman for Hamas. In 2007 and 2008, amidst two federal trials, the U.S. government named CAIR a co-conspirator in the raising of millions of dollars for Hamas. No doubt, having Ruiz represent both CAIR and AMANA serves to bring the two groups together, helping them to exert more influence. Indeed, in 2012, 2013 and 2014, the groups joined to co-sponsor rallies to speak out about violence in Syria, Egypt and Gaza. The latter event took place in Downtown Miami on July 20, 2014. The rally was supposed to be in support of Gaza, but it quickly turned into one that was instead pro-Hamas. A smiling Sofian Zakkout is seen on video, as coordinated chants of “Let’s go Hamas” and “We are Hamas” are shouted from the crowd. A reporter was also assaulted by rally goers, targeted for being Jewish (“Zionist”). CAIR issued a statement saying that it had nothing to do with the rally, but a flyer for the event clearly shows the CAIR-Florida logo next to its AMANA logo counterpart. AMANA’s Zakkout organized the rally, and numerous pictures of the flyer are still found on his Facebook site. These flyers are not unlike the flyers that were made up for the other rallies involving CAIR and AMANA, containing CAIR and AMANA logos. On November 15, Ruiz participated in the CAIR-South Florida annual banquet held at a hotel in Fort Lauderdale. 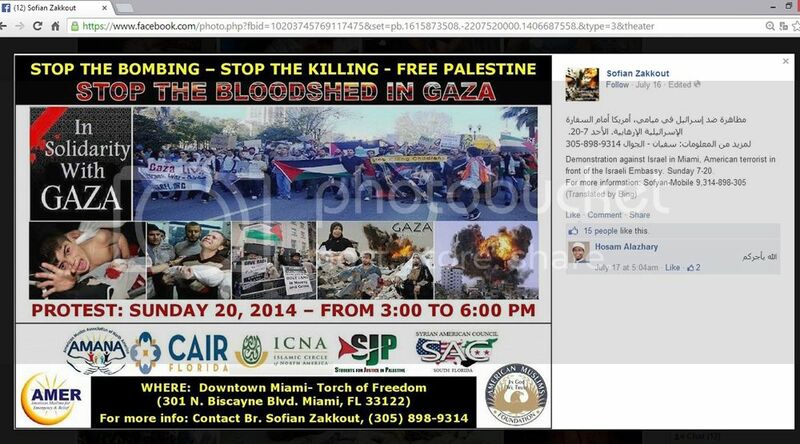 He stood up on stage with the other CAIR-Florida leaders, including CAIR-South Florida Executive Director Nezar Hamze and CAIR-Tampa Executive Director Hassan Shibly, who has stated that he believes Hezbollah is not a terrorist organization. Earlier in the day – the same day as the banquet – the government of United Arab Emirates (UAE) named CAIR a terrorist organization, along with violent groups such as al-Qaeda, Boco Haraam and ISIS. Ruiz brought his family, including his wife and two underage kids, with him to the banquet. Given the radical Islamic nature of the groups sponsoring the event, one can argue that this was child abuse. Outside the banquet was a peaceful protest, which this author attended and delivered a speech at. Ruiz came outside to intimidate and take photos of all the protesters. In Ruiz’s case, the answer is clear. His involvement with CAIR and AMANA negates any pretense of patriotism, and instead open the door for questions about subversion.